File photo. People swimming in the sea during the hot weather this summer. 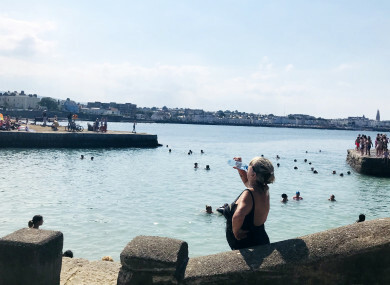 TEMPERATURES ARE SET to hit the high teens for much of this week, with one day set to exceed 20 degrees as high pressure “looks set to dominate”, Met Éireann has forecasted. There’s a cold start to this morning but that will give way to dry and bright weather in most areas with temperatures set to peak at around 15 degrees. Patchy rain and drizzle will kick off tomorrow but that will again give way to sunny spells later with temperatures ranging from 13 to 16 degrees. It’ll feel “noticeably warmer” on Wednesday with sunny spells around the country. Top temperatures will range between 17 to 21 degrees, with the south-east of the country enjoying the warmest weather. The following days will remain largely similar before it gets cooler again by the weekend. Email “It's going to hit 21 degrees this week (no, really)”. Feedback on “It's going to hit 21 degrees this week (no, really)”.